Michael Rectenwald, recently retired from New York University, spent his life as a leftist — a self-described Marxist, in fact. When on Twitter he began to turn against some of the recent excess, particularly on college campuses with their win-by-intimidation tactics, you know what happened: his leftist colleagues took it as an opportunity to examine their behavior and open a dialogue with people of different views. You know that’s not what happened. That’s never what happens. Instead, they completely isolated him on campus. Out of one hundred colleagues, perhaps two would say hello to him. People would not even get in the elevator with him. Nothing in his experience necessarily implies he would therefore abandon leftism. After all, even under the Soviet Union, there were plenty of cases of communists condemned to death by the Party who nevertheless continued to believe. “The Party is always right,” they said. He spent his career writing in left-wing journals about left-wing ideas. He knows everything there is to know about postmodernism, deconstruction, and all the rest of it. He knows these folks and their ideas inside and out. And what happened to him at NYU caused him to reexamine all of it. He’s now reading Ludwig von Mises and describes himself as a libertarian. We discuss concepts like postmodernism and deconstruction and what they’re all about, in an episode that’s been getting rave reviews. Rectenwald also has some interesting speculation as to why big business is jumping on the “social justice” bandwagon. Meanwhile, today’s episode of the Tom Woods Show, coming out later in the day, was suggested by a member of the Tom Woods Show Elite, where my Supporting Listeners gather. 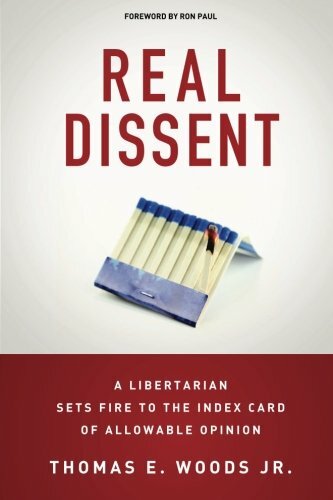 It’s the ultimate libertarian reading list, along with my (of course) fun commentary. Haven’t subscribed yet? For shame. Costs you nothing, and gains you knowledge every weekday.